Charles Chilton wrote and produced three Journey into Space serials for BBC Radio in the 1950s, detailing the adventures of Jet Morgan, Doc Mathews, Lemmy Barnet and Stephen Mitchell. The first Journey into Space serial was broadcast originally in 1953, with Chilton’s novelisation being published the following year by Herbert Jenkins Ltd. Compared to the only existing broadcast version of the serial, this novelisation follows the scripts reasonably closely, with some minor snips here and there and repositioning of some of the narrative to make a more dramatic opening. However, the most significant deviation from the original scripts is the material covering the first four episodes. The popularity of the serial didn’t take off until the launch of the Rocketship Luna in the forth episode, hence when the serial was remade for the BBC Transcription Service in 1958 all the material prior to this point wasn’t included in the re-make. For the novelisation Chilton consolidated and re-wrote the material up to the launch, so it deviates substantially from what actually was originally broadcast. BBC Audiobooks has recently started to release readings of Doctor Who novelisations from the Target imprint, which has been a great success, so it’s understandable that a reading of the first Journey into Space novel has been chosen to tap into a similar market. Actor William Hope, perhaps best known for his performance as Sgt. Gorman in the film Aliens, provides the reading of the complete and unabridged novel for this release. As the narrative of the novel is taken from the Doc’s journal the Canadian born Hope is a natural choice for the quiet, softly spoken tones of the American Doc Mathews. However, Hope’s interpretations of the Scottish Jet, the Cockney Lemmy and the Australian Mitch are a little too literal. I not saying the original characterisations in the radio version are the most subtle of creations (neither are they in Chilton’s written prose), but Hope’s vocalisations do take a little getting used to, with Jet’s full-on Scots burr being particularly grating to begin with. The Doctor Who novelisation readings have made use of music specially composed to aid the drama of the reading and this release has followed this lead. The music supporting the Journey into Space reading is used to develop a tone of awe-inspiring space flight rather than pulpy 1950s sci-fi. At times it is bombastic though I didn’t find it intrusive or distracting, and on the whole succeeds well. The approximately seven hours of reading is spread over six discs, with anything between twenty-one and twenty-six index points to allow for easy access to the material. The sound is clear and fine with music mixed well so as not to obscure the dialogue. The discs are presented in a hard plastic CD case with two discs held either side of the central part of the case along with two arms in each side which hold a further two discs apiece. The release makes use of the fabulous cover to the early 60s Pan re-issue of the novelisation – with a dramatic upward view of Luna on the launch pad. A great choice. What is the point of these old sci-fi novel readings? Especially as this is an adaptation of an already released radio serial… Well, this is another slant on the serial by its original author - this isn’t a complete verbatim adaptation of the scripts it does feature one aspect over what is included in the audio adventures of Jet and his crew - descriptions of how Chilton imagined the visualisation of some aspects of the story; including the launching ground, the crew cabin of Luna and countless others - a real enticement for any fan of the serials. But what is the point if, as in this case, the novelisation is quite easy to get hold of through second hand book services on the Internet for a reasonable price? Obviously, readings are there for those with vision difficulties or have other issues with reading, but this is just another way of appreciating the material - a reader can bring a new interest to a work by the way that they read it. This has proven to be a great success with the Doctor Who Target readings, with the choice of readers being particularly effective. So what of William Humble? I’ll be honest and say as a fan of Journey into Space I would’ve prefer David Jacobs (the last surviving member of the cast) or Chilton himself to have performed the reading – maybe they were asked and declined (I don’t know) – but Hope does make a good fist of it, although I would have preferred if his producer had suggested a toning down of his Scots accent for Jet. The timing of this release is a good one hot on the heals of the broadcast of the new episode of Journey into Space broadcast on BBC Radio 4, which was well trailed, reminding or introducing the series to the general listening public. So, who is this release going to appeal to? Well, anyone who enjoyed the recent new episode or has memories of the original series or enjoys 1950s sci-fi; if you have enjoyed BBC Audiobooks Doctor Who Target readings you will find a lot to enjoy here; and of course Journey into Space fans. But will the latter actually buy this release? - presumably the core target audience. A lot of Journey into Space fans will still be smarting over the abandoned release in physical CD format of the final serial, The World in Peril. Yes, you can purchase The World in Peril from many download stores, but the sound quality is very poor (due to the inherent limitations of the download format - a slap in the face to all the restoration work done on it to make it sound the best it has every done), and so isn’t worth the purchase. Personally, I feel this reading is a very worthy addition the universe of Journey into Space and is definitely worth a purchase. 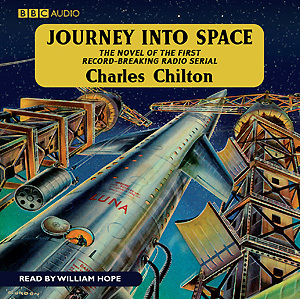 I hope other Journey into Space fans do purchase it, and it proves to be a great success, and spurs BBC Audiobooks on to release readings of Chilton’s novelisations of the other two serials, and a CD release of The World in Peril… here’s hoping!